Still life of violin and case. 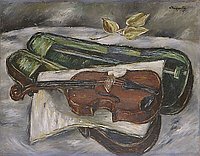 A violin lies horizontal, scroll on left and end-button on right, on a white cloth atop an open black violin case with green interior. Bow lies in top of case, which lays on a white surface. A three leafed branch sits in background center. Background is grey.